The Workflows App is one of the most powerful marketing automation tools in HubSpot, allowing marketers to create personalized email cadences that can be triggered in a number of different ways: when a contact either submits a form on your website, connects with your company on social media, clicks on one of your AdWords ads, or becomes a marketing qualified lead. While email is very effective, it is not the only touch point you can have with your leads. If you can start a conversation with your leads through email and calls, you’ll have twice the opportunity to bring them further through the sales funnel. Stats says that businesses that use marketing automation to nurture prospects see a 451% increase in qualified leads and a whopping 92% of all customer interactions still happen over the phone! Email automation can not only help convert leads into customers by enrolling your leads automatically into one of your workflows once they interact with your website or content, but it can also help you reawaken inactive contacts that fell through the cracks. It can also be leveraged to delight existing customers and encourage greater product adoption, upsells and evangelism by putting together a re-engagement workflow and enrolling contacts once they've met certain list criteria. 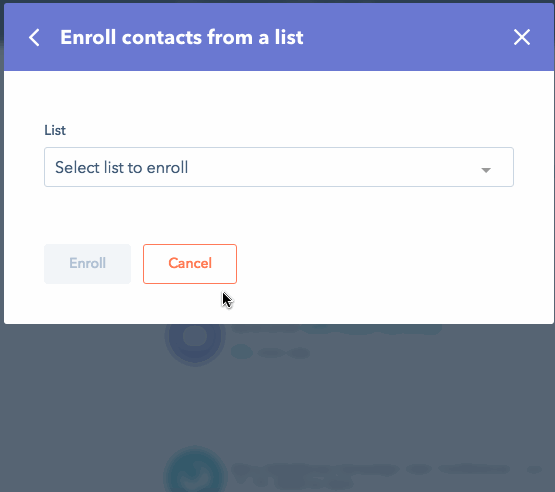 Here is more information on how to enroll contacts into workflows. You no longer need to rely on call tasks or reminders! 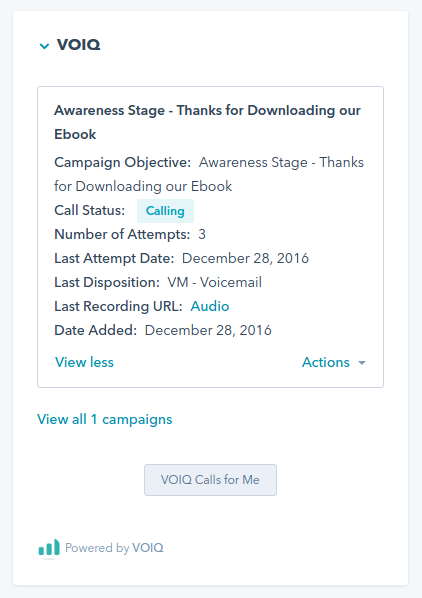 With VOIQ for HubSpot, live calls can now be easily scheduled to enrich your prospect’s experience through the buyer’s journey. Whether your lead requested a demo, downloaded an ebook, opened an email, or when you feel they could benefit from a follow-up call to keep your company top of mind, you can layer a sales call into the journey. 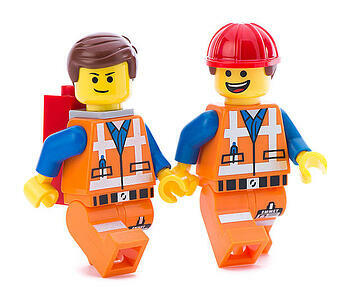 Having solid lead response practices is crucial to ensure that no lead slips through the cracks or goes unqualified. 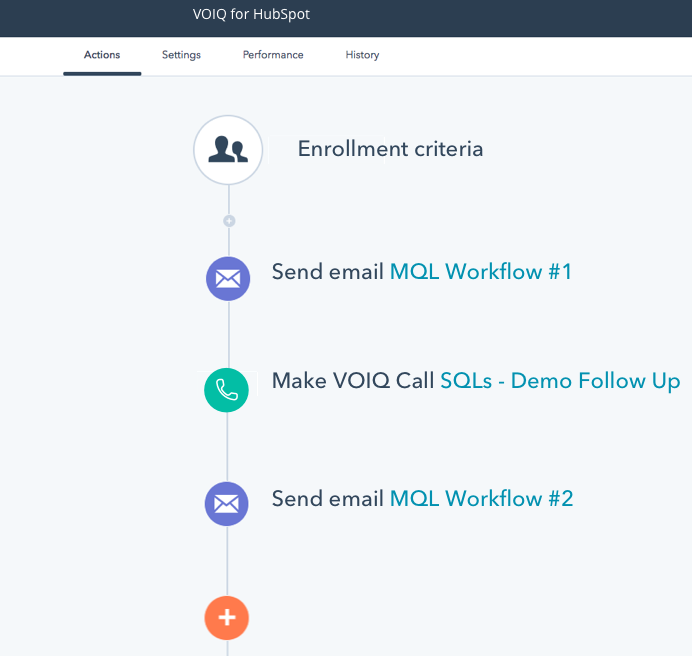 Launching sales qualification calls made by VOIQ sales agents directly from your workflows allows Marketers, for the first time, to control and track calls with the same ease as emails or social touchpoints. It also empowers Sales reps to automate the heavy lifting and focus more energy on the deal without the distractions of scheduling issues or data entry, as all call history is logged into HubSpot CRM. When you scale this up to tens or hundreds of conversations a week, it makes a huge difference! 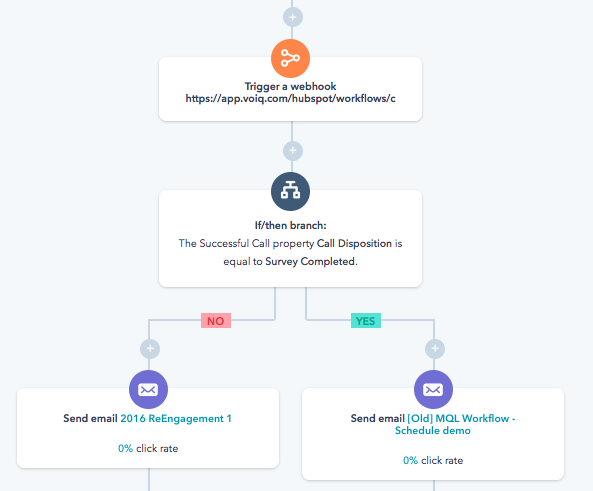 One of the best things with VOIQ’s integration is being able to completely customize your follow-up touchpoints and messages with a lead based on the outcome of a call, all from within a single workflow. You can do it by adding a “Send email” action to your VOIQ call “Yes or No branch”, that will send an specific email to the contact who meets each branch criteria. You can also add additional if/then branches to further segment your leads based on other email or call responses that are further down the workflow. With this closed-loop integration, Sales (or VOIQ’s agents) is able to track the online behaviors of leads in order to turn cold calls into warm ones. What’s more, Marketing has a better understanding of where their best leads come from, how many calls or emails lead to sales, and how to optimize their messaging using insights captured during the call. Find out more on how to use branching logic in workflows here. Happy Thanksgiving y’all! I hope these quick hacks work for your team, and if you have any questions about how to install your VOIQ for HubSpot app, click below.